MBA is a degree that is globally recognised to identify people who are skilled and trained for careers in business and management. Many people consider a degree in management as their chance to enhance job prospects and build lasting contacts. However, an MBA has much more to offer and the benefits are not strictly limited to the business world. MBA can help you explore your hidden potential and help you develop leadership skills. Team management, strategic thinking, positive attitude, and confidence are some of the soft skills that are most commonly associated with good leaders. These skills are required for every professional in a managerial role in order for him to lead and manage his team and carry out the task efficiently. MBA coursework is designed to teach soft skills to bring out your leadership skills to the forefront. A degree in management can make you an efficient communicator. One of the primary objectives of an MBA program is to teach you through classroom interactions and presentations to express your ideas more clearly and distinctly. Communication is an art and practice can make you perfect. Good communication skills can help you build better relationships with your co-workers and employees, communicate your goals coherently and ideas more distinctly. It can even prove invaluable in your personal life. Doing an MBA can give you the opportunity to discuss business trends with your classmates and faculty. Open– ended discussions and interactions with other well- informed people is most likely to provide you new perspectives and enrich your knowledge. Getting to discuss global market trends, relevant issues to the sectors that appeal to you, and informed insights on various topics is sure to develop your analytical thinking and ability to make informed decisions. MBA not only teaches you to think like a business person but also gives credibility to your image and helps you market yourself as a true professional. Even if you want to start your own business, a professional management degree will help you win the trust of your investors and help add value to your business. Management colleges commonly have a lot of diversity on campus as they mostly select students from different regions and cultures. Life at a B- School gives the students not only an opportunity to broaden business career prospects but also to broaden their cultural and intellectual horizons. Many management colleges also have tie –ups for exchange programs with top B- schools abroad. 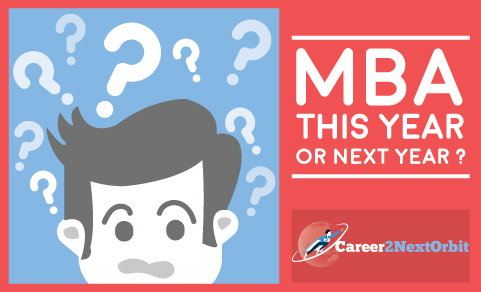 MBA: This Year or Next Year?